The 17th annual Deep Creek Dunk will be held Saturday, Feb. 21, 2015 and is one family friendly event you don’t want to miss. Not only can you help raise funds to benefit athletes of Special Olympics Maryland, you also get the chance to brave the icy cold water in Deep Creek Lake for the chilly thrill of it, and bragging rights, of course! This year, the weekend-long event kicks off Friday, Feb. 20, 2015 at Honi-Honi Bar with Goosebumps and Grapes, a wine tasting held around a toasty bonfire from 6 p.m.-10 p.m. Admission is $20 with proceeds going to Special Olympics Maryland. 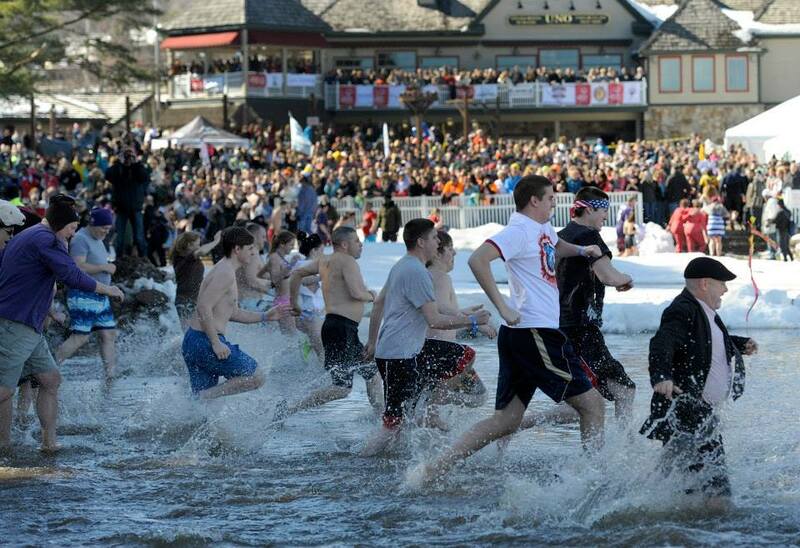 The Deep Creek Dunk will be held Saturday, Feb. 21 from 2 p.m.-3 p.m. on Deep Creek Lake behind Uno’s Pizzeria. Dunkers will enter the lake in waves, with Family Dunk participants first, followed by general Dunk participants. The annual Deep Creek Dunk is a sight to be seen. Hundreds of participants dressed in everything from bathing suits and winter caps to super hero costumes make their way cheering and laughing in and out of the water. Some go full-bore and submerge themselves, while others only dare to go waist deep. All the while, hundreds of spectators shout their support from the snow-covered banks of Deep Creek Lake. Last year, a thick layer of ice had to be cut away from the surface of the lake for the event. The water itself was about 32 degrees and the air temperature was about 50 degrees. If you are planning to participate in the Deep Creek Dunk for the first time, event organizers have a few tips for you. Dunkers of all ages are welcome, however those under the age of 18 must have a waiver signed by a parent. All participants must enter the water inside the designated Dunk Zone. There is a separate, secure Dunk Zone for participants 15 years old or younger and their chaperones. It is recommended participants wear a swimsuit or athletic clothing. Wetsuits are not allowed. Shoes or water shoes are required. You do not have to dunk your head. In fact, organizers recommend that you only go waist deep. Do not worry about being the first group to enter the water. Avoid the crowd by waiting 10-15 minutes. Don’t forget your camera! You definitely need to record this moment for posterity, so bring along a waterproof camera or bring someone with you to take pictures from dry land while you dunk. It is recommended that you register for the Deep Creek Dunk in advance by visiting the event website. A $75 donation is required to register, however you can sign up to raise additional funds. Event sweatshirts are only guaranteed to those who register in advance. Onsite registration the day of the dunk begins at 12 p.m. and closes at 2:50 p.m.
Our McHenry, MD bed and breakfast, located on the shores of Deep Creek Lake, is an easy 10-minute drive to the event site. Plan to stay the weekend at Lake Pointe Inn and fuel up the morning of the Dunk with a delicious gourmet breakfast in one of our dining rooms. Come back to the inn after the event to warm up beside the fire with a mug of hot cocoa or hot tea. In addition to the large fire place in our living room, each of our beautiful comfortable guest rooms has a gas fireplace. Further pamper yourself with a massage or be sure to reserve one of our rooms or suites that includes a spa tub for a long, hot soak.